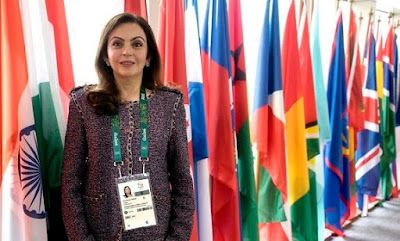 Rio de Janeiro : Noted sports promoter and founder chairperson of Reliance Foundation, Nita Ambani was today elected as an individual member of International Olympic Committee as she becomes the first Indian woman to join the prestigious body which governs Olympic sports in the world. After being nominated in June by the IOC Executive Board, Nita was today elected by IOC members at the 129th Session of the world body, just a day before the opening ceremony of the 31st Olympics Games here. 52-year- old Nita is the only current active individual member of the IOC from India and she will serve at the high-profile world body until she attains the age of 70. Former Indian Olympic Association Secretary General, Randhir Singh, who served as IOC member from India from 2001-2014, is currently an honorary member of the world body. The independent selection process follows a new procedure for the recruitment of IOC members based on the Olympic Agenda 2020 recommendations. These nomination were done wholly on merit and then elected by existing IOC members. As founder and chairperson of the Reliance Foundation, Nita has been steering initiatives in the area of education, sports, health and art and culture. She is involved in promoting multiple sports in India with focus on developing talent through a number of large-scale grassroots initiatives. The grassroots programmes that she has initiated have reached out to over 3 million children in multiple sports. She is the architect of Indian Super League which has helped in raising the profile of Indian football. "I am truly humbled and overwhelmed to be elected by the IOC. This is a recognition of the growing importance of India in the world stage and a recognition for Indian women," Nita said in a release. "I have always believed in the power of sport to shape our youth. I believe that sports brings together communities, cultures, and generations has the power to unify and unite people. I look forward to spreading the spirit of Olympics and sports across our nation," she added.